Bacillus is a common bacterial genus in Chinese traditional sun-brewed moromi. Some Bacillus species can metabolize sauce flavour and aroma substances. To address the insufficiency of flavour microbes in soy sauce fermentation, we used 16S rDNA sequence analysis to identify the CS1.03 strain, which was isolated from moromi produced through the traditional and natural sun brewing methods. A Box–Behnken design was used to optimize the addition technology of CS1.03, and ammoniacal nitrogen content and sensory evaluation were adopted as determination indices. GC–MS analysis was also performed to analyse the flavour components. Results identified CS1.03 as Bacillus subtilis. The optimal conditions yielded 10.7 g/L ammoniacal nitrogen in fermented soy sauce with rich aroma and flavour, and a sensory evaluation score of 90.5. GC–MS analysis revealed that the contents of phenol, aldehyde and ketone are all increased. 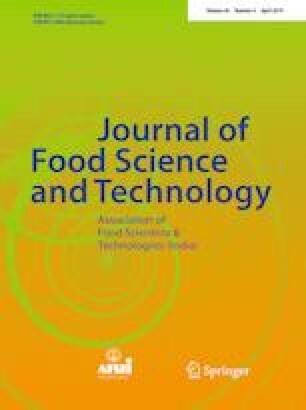 These results demonstrated that CS1.03 could improve the flavour of soy sauce and shows good potential for application in soy sauce fermentation. The strain of CS1.03 has been collected in China Center for Type Culture Collection (CCTCC, Wuhan University, Wuhan City, China), and its collection number is M 2015791. The online version of this article ( https://doi.org/10.1007/s13197-019-03678-w) contains supplementary material, which is available to authorized users. This work was supported by Hunan Provincial Natural Science Foundation of China, analysis of brewing microorganism and construction of dominant flora in soy sauce with high-salt liquid state technology (No. 2018JJ2421) and the Foundation Project of Changsha Science and Technology Program, research and demonstration of key technology in soy sauce production with multi-strain fermentation (No. kq1601013). There are no copyright disputes. We thank Liwen Bianji, Edanz Group China (www.liwenbianji.cn/ac), for editing the English text of a draft of this manuscript.